Welcome to the weblog of the ADAPT group. Our first entry is provided by dr. Thomas Gladwin, in which he reflects on a recent article in Dutch newspaper "De Volkskrant". Transcranial Direct Current Stimulation (tDCS) is the application of a weak, controlled current to the brain, via saline-soaked sponges touching the scalp. Modern versions have been used for over ten years as a revalidation tool and a method in cognitive neuroscience. The basic effect of tDCS is to temporarily activate or inhibit parts of the brain. The method was the topic of a recent newspaper article, which presented a - correct, but see below - positive impression of its safety and potential. I was contacted to provide some information and demonstrate the method. That was fun to do, but I also think there's something of an obligation to let people know what's going on in research inside the university. Following from that, I thought this blog might be a good place to go deeper into the material. I'd like to start by talking some more about safety and addressing some myths. 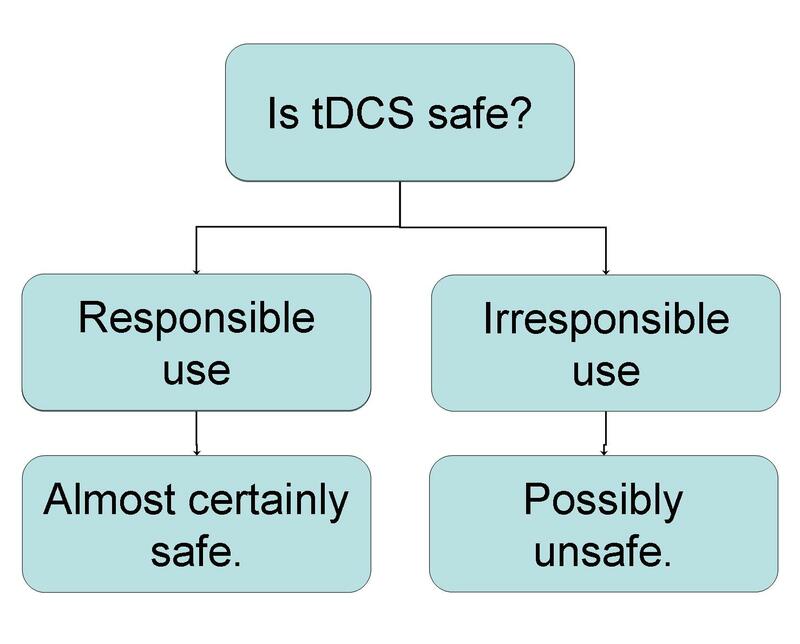 The most important question to ask concerning tDCS is: is it safe? The schema below presents the basic consideration to answering that question. Damage or abnormalities around the head. If there's any doubt: don't do it without a doctor's permission! Large sponges are used to apply the current, of around 7 x 5 cm (think: a rectangle around the length of your finger). The sponges are made wet (somewhere between only damp and actually dripping) using saline (NaCl-solution), not normal tap water. The maximum current strength is 1 to 2 milli-Ampere. The maximum time the current is on is between ten en twenty minutes. You don't do it more than once unless you're aiming to cause some kind of persistant change. You certainly don't do it more than once per day. High-quality equipment with sufficient safety mechanisms is used. "Responsible use" means that at least all the criteria of the checklist are satisfied, unless any deviations are based on scientific or medical expertise and necessity. But given careful, responsible use, safety studies in animals and humans indicate that the method is almost certainly safe. The current density and duration are far below the levels at which tissue damage can occur. What you may experience are mild, temporary side effects: people sometimes report headaches, dizziness, nausea or various unpleasant sensations at the skin under the electrodes. In our experience, the most likely problem is an irritating scalp sensation. We do not continue the experiment if the sensation persists despite re-dampening the electrodes. Always remember: if you're a subject you always have the right to stop participating in an experiment at any time! I've encountered a number of myths about tDCS. TDCS is a kind of electroshock. No: an electroshock is a completely different technique, with extremely different current levels, immediate effects, and long-term consequences. They both involve current and the brain, but that's about as far as it goes. TDCS doesn't cause any "shock", but a quite subtle facilitation or inhibition of normal neuronal processing. TDCS is a kind of lobotomy. No: tDCS doesn't do damage to the brain, while performing a lobotomy involves consciously destroying a part of the prefrontal lobes. In contrast, we aim to support the prefrontal lobes by enhancing their functions. Using tDCS means that you see individuals only in terms of brain regions.. No, that's not how we see things at all: we do expect that tDCS influences the brain, but the point is that that can enhance a cognitive-behavioural training, which in turn allows an individual's relationship to his or her environment to improve. We don't see tDCS in a vacuum, or neural functions in isolation from meaningful thought and action in a social environment. Whether tDCS in fact offers added value to clinical interventions: that's something scientific research will decide. However, there's sufficient evidence to take the possibility seriously. TDCS is a kind of miracle cure. This is a tricky one: is really does seem like tDCS can enhance healing processes somehow, in a variety of contexts, especially in combination with training. But it's still a relatively new technique, many potential application are speculative and many results must still be replicated. It's also not certain that tDCS will turn out to be safe in every specific medical condition or subject group: each case will demand renewed consideration of safety. In any case: be careful with what you expect, or promise. So what can you realistically expect from tDCS? Mainly: given responsible use, a safe way to enhance training effects (e.g., of motor function after a stroke), and possibly some kind of positive effects due to increased neuroplasticity. View the original article from De Volkskrant (in Dutch).